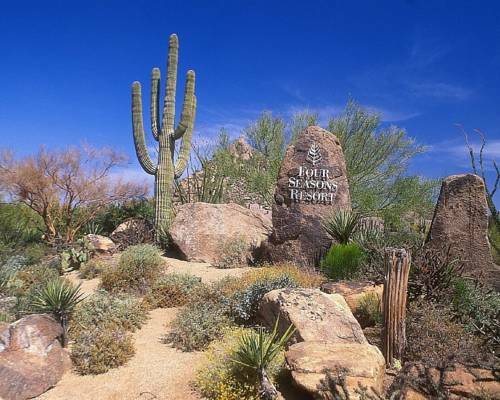 The Four Seasons Resort Scottsdale at Troon North with its stunning setting and superb service is dedicated to making every stay memorable. Located in fashionable North Scottsdale at the base of Pinnacle Peak surrounded by the beauty of Sonoran desert and world-class golf courses. The resort is in the residential community of Troon North. Lunch Snacks and Cocktail - Daily Located at the pool s edge this outdoor cafe serves lunch snacks and beverages. Casual attire. Small Plates- Daily 5pm to 11pm Guests can enjoy indoor and outdoor dining from a small plate menu as well as an array of cocktails and other beverages. Giant copper-clad fixture tells time the old fashioned way. It stretches 62 feet and points to the North Star. Collection of memorabilia and historical items, including a big rock with chains that served as the first Phoenix jail.